After the last guest stumbled out of the Mac Attack Pot Luck in a carb induced stupor, I glanced at the Sarah Sylvia Cynthia Stout avalanche of cheese encrusted dishes and picked-over aluminum serving pans. I thought about cleaning up, I really did, but then my legs buckled and I collapsed in a heap on a nearby chair. Saddened by the fact I missed out on tasting several contenders as my hostess duties kept me running around the house like a kid hopped up on Halloween candy, I searched in vain for leftovers. Almost all the pans were empty but, to my delight, I unearthed three quarters of a pan of Amanda Williams' award winning Midwestern Mexican Macaroni and Cheese. By the time Amanda appeared at the Mac Attack Pot Luck, two pans of spicy mac in tow, the competition was in full swing and counter space limited. Many people had already chosen their favorites and it seemed Amanda might have been "late to the party" if you catch my drift. But Midwestern Mexican Mac turned out to be the dark horse tying for third place honors. I must admit I was skeptical. I'm a mac traditionalist; Just the cheese and noodles, mam. 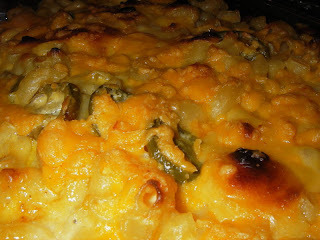 Amanda's mac had big ol' hunks of Jalapenos scattered about and the cheese was Crayola Sunglow yellow. But after one bite, I was sold. The Jalapenos didn't overpower the cheese, it had a great tang, a creamy texture and you could dance to it. There was something else though, some kind of illegal substance that forced me to keep eating it even though I technically should have been full. Well now that I've read the recipe, all has been revealed. Feast your eyes on this, if you dare. Cook about 1-2 minutes less than the package directions. While the macaroni is cooking, Cut cheese into small cubes. Then, take the cooked macaroni, drain but do not rinse. Return the macaroni to pot. Add butter, milk, and most all of the cheese cubes to hot macaroni. Mix well, until butter and Velveeta melt. The mixture will be soupy. The cheese cubes will not melt completely. Cover the top with the remaining cheese. You want the top to brown and the pasta to set. According to Amanda (@losamanda) this recipe is a variation of a recipe from Sienna Farris @rawsienna. She thought the original version was too thick so she tweaked the recipe by adding peppers and more milk. Amanda loves to cook and eat and considers her level of cooking experience,"medium." She wants everyone to know this about her dish: It is spicy and not for children or The Weak. Sounds delicious! 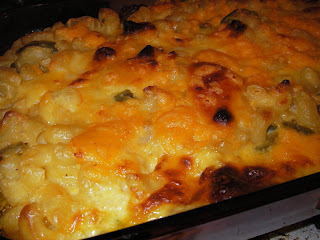 I love macaroni & cheese with a twist! :) Thanks for sharing! I love mac and cheese. look at all the cheese. This mac and cheese looks so good!